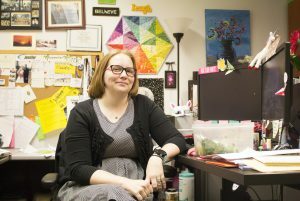 Jennifer Wellborn is the West Campus Student Life Coordinator, she’s been in this position for the last four and a half years, previously she worked at the East Campus for a year. Jennifer Wellborn in her office at the West Campus. Wellborn is also the coordinator of Pima Community College’s Jade Retreat, a three-day leadership and social justice conference. There will be more opportunities for Pima students in the Spring. Q: What is student life? A: We are where students get involved in clubs, leadership programs, multicultural programming, basically if it’s happening at Pima and it’s not part of a student’s class. Typically it’s Student Life either putting it on or has a hand in assisting with it. We partner with a lot of different departments to put on programs for students. Here at West Campus, we have between 30 and 40 different clubs a year. We do have some district wide clubs as well, like Phi Theta Kappa honors. Q: At the Jade Retreat you discussed how students can be advocates, what are advocates? An advocate could be, anyone who wants to help any particular group of individuals move an issue or policy, that helps some sort of greater good forward, I guess trying to keep it fairly broad. they don’t have to be a member of that particular identity or group. So if they’re not a member of that particular identity or group, they would be considered an ally. … you can be an ally and an advocate for other communities because you sometimes have and your privilege affords you to be in spaces or to be heard. A: Exactly. So whether you’ve earned it or not, you might be able to say, “Hey, you know, let’s give this group an opportunity to say their piece or this group over here has this great idea.” obviously you want to acknowledge this isn’t my idea. and things like that. That’s what being an advocate is trying to, to help those groups move their ideas forward,being a part of those groups when you can, but being an ally is really trying to utilize what, resources and capabilities you might have to help others. Q: At the Jade Retreat what were some ways that students came up with the advocates here at Pima? They actually come away from Jade with what we call a five, five, five action plan and that’s what they want to do in the next five days, five months and five years because it’s great to go to this and be energized … but if you don’t come away from it with some sort of plan or goal is, that energy and that excitement can easily be lost. Q: Scenario question. I slip up and use the wrong pronoun. What’s my course of action? A: Just make a quick acknowledgment, apologize, move on. I think anybody would appreciate that you’re making an effort. If somebody made you aware of what their preferred gender pronouns are, make the effort to utilize them and when you slip up, apologize. Q: Is there a designated, a free speech zone on campus? A: No. The state legislature changed the free speech zone law a couple years ago and they got rid of free speech zones. … Now any outdoor non-classroom space is free game for free speech. They’re not allowed to go around the library or come into any of the indoor spaces. If they want to reserve one of the tables in the lobby, they have to reserve it or pay for it or doing nonpartisan voter registration type of activity. Q: What’s the Emerging Leader Summit? A: It’s a day long free leadership program. We set it up kind of like a conference where there’s 15 minute workshops and students go through those throughout the whole day. We have a keynote speaker, they get lunch. And we cover a variety of different topics from communication to leadership styles. It is kind of our introductory leadership program.